Fr. 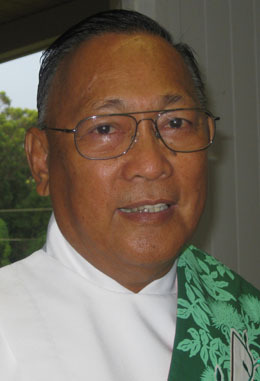 Anthony Rapozo is the Pastor of St. Catherine Parish. Born in Lihue, Kauai, to parents Wayne and Stephanie Rapozo, he has two younger brothers—Jason and Lucas. Fr. Anthony attended St. Catherine School, Immaculate Conception School and graduated from Kauai High School in 1988. He received his Associates Degree in Liberal Arts from the University of Hawaii and a Bachelor of Arts Degree in Religious Studies from Chaminade University. Fr. Anthony continued his studies at St. Patrick’s Seminary and earned his Masters in Divinity in 2011. He was ordained to the transitional deaconate in December 2010 and to the priesthood on December 30, 2011. 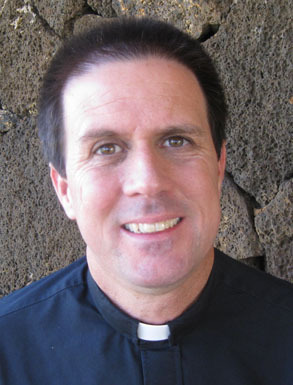 His first priestly assignment was at St. Michael the Archangel Church in Kailua, Kona for two years. He was assigned to St. Catherine Parish as Parochial Vicar. Fr. Anthony was formally installed as Pastor by Bishop Larry Silva on May 25, 2014. I came to Hawai`i in my teens to live with my relatives in Kāne`ohe, but went to Cupertino High School since I was a little too kolohe for my relatives. After High School I entered the Brigittine Monastery in Amity, Oregon. After staying some seven years in the community I decided monastic life was not for me and left. Becoming a registered Medical Assistant and had a desire to help people, I returned to Hawai`i and attended Hawai`i Loa College in Kāne`ohe. It was my desire to become a PA (Physician’s Assistant) but math was quite difficult for me and changed my major to Pre-Theology. After completing HLC I entered into tourism and became a tour guide/driver for Polynesian Adventure Tours. I did this job for twenty-three years and loved it very much but I believe the Holy Spirit was calling me. I think the Holy Spirit wanted me in the tour business to get me out of my introverted self. I am still quite introverted but I am finally comfortable talking with people and love it very much, but at times I need the silence to ‘recharge’ my batteries. Entering into the seminary with the diocese of Honolulu in 2010 and finally becoming ordained to the Holy Priesthood in 2018. I am so honored the Bishop allowed me to enter as a seminarian at my age. I am an older vocation and believe the Lord did not pick young men between the ages of 18 and 30. The Holy Spirit chooses those who desire to work in the vineyard of the Lord. I pray that I will be a good priest and ask for your prayers. I came to Saint Catherine’s Church about five years ago. I was a seminarian and I fell in love with this parish. It was during my last semester in the Seminary in Wisconsin that I was praying in the chapel. I am not joking but I was praying that I would be sent to Saint Catherine’s Church! I received a call a couple days later from Father Anthony saying that I would be assigned to Saint Catherine’s. I was so happy the Lord answered my prayer. Father Anthony told me before the bishop was to tell me. It was funny but he said, “When the bishop calls then act surprised.” I am so honored to be here and will do my best in serving the faithful while assigned to Saint Catherine of Alexandria ofKapa`a, and her missions of Saint Sylvester at Kīlauea and Saint William (what a nice name) in Hanalei! Me ke aloha pumehana! My name is Preston-Jay Pascua Castro and I was born and raised in Waipahu, Hawaii. I still reside in Waipahu with my grandparents, Roland and Edith Pascua along with my two younger sisters, Amber and Velaxis. Throughout my high school career, specifically my junior year and senior year, I was a part of a program called, “Teachers Cadet” where my classmates and I were sent to local preschools, elementary schools and intermediate schools to assist teachers in the classrooms. In the meantime, I was attending Confirmation classes at St. Joseph in Waipahu for just one year. It was not until November 2011 during Saturday Vigil at St. Anthony’s Retreat Center in Kalihi where I first heard my calling to the priesthood. After the retreat, I spoke to some of the AGAPE mentors and parishioners about my encounter with the Lord. Nevertheless to say, I just prayed about it and life went on. During this time of discernment, I received an unexpected call from Fr. 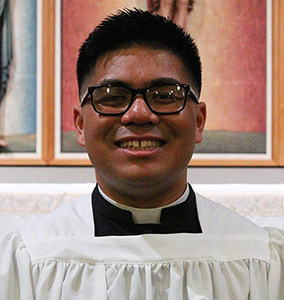 Greg Honorio who told me that one of the parishioners from St. Joseph in Waipahu, Vecy Pascual, had spoken to him that I was discerning for the priesthood. To summarize the conversation, Fr. Greg had told me that he’ll contact the Vocations Director (who was Fr. Pascual Abaya at that time) to let him know that there was a young man discerning for the priesthood. After I graduated Waipahu High School and got Confirmed at St. Joseph in 2012, I decided to choose to become a paramedic over the priesthood and my dream in becoming an elementary teacher. The reason why I decided to switch majors is because it has occurred to me that one of the promises that I made to my mother on her deathbed that as her son, I was going to fulfill her dream in becoming a paramedic because she died a year before receiving her degree. When I attended Leeward Community College from Fall 2012 to Spring 2014, I failed a total of 6 classes and was on an academic probation. After realizing how unhappy and stressed out I was in this career, the thought of priesthood came back to mind so instead of pushing the priesthood aside, I decided to go along with it. When it was time to sign up for the Spring 2014 classes, I ended up taking classes that’ll prepare me for the priesthood such as speech, English, religion and history. While attending school and working two jobs, I kept meeting with Fr. 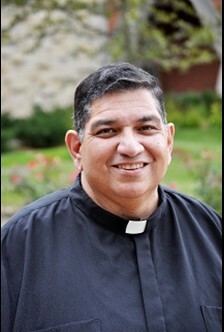 Pascual Abaya about my application process to the Diocese and Mount Angel Seminary in Oregon. By the end of Spring 2014, I saw a drastic change in my grades. I started to pass my classes and I was at peace with my decision in applying to the Diocese and Seminary. On August 11th, 2014, I was officially accepted by both Bishop Larry Silva and Mount Angel Seminary. On May 12th, 2018, I graduated from Mount Angel Seminary in Saint Benedict, Oregon with my Bachelors Degree in Philosophy and Religious Studies. 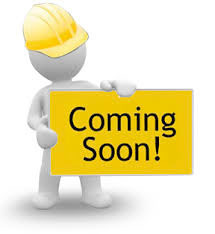 As of right now, I am in the application process for graduate studies at St. Patrick’s Seminary in Menlo Park, California.